VERY Rare and original, Albumen CDV Photograph of Confederate Civil War Cavalry Captain Thaddeus P. Siler - double armed with cavalry sword and revolver. This wonderful Photograph measures approx. 2 1/8 by 3 3/8 and is mounted on its original, photographer's card mount (overall size of mount is 2 1/2 by 4 1/4). It pictures a very serious looking, Commissioned Cavalry Officer wearing a frock coat with shoulder bars and a kepi. He holds a cavalry sword in an upright position in his right hand and in his left he holds a revolver displayed across his lap. The scabbard of his sword rests across his lap. He appears to be wearing a two-piece sword buckle but we cannot make out the markings. The photograph carries the backmark of the photographer - J. The Officer is identified with what appears to be be period pencil notations on both the front and the back of the CDV. On the front the notation reads Capt. Carolina Cavalry / Hampton's Brigade / Stewart's Cavalry. On the reverse the notations read: T. / Stewart's cavalry / In Virginia, Penn. / Capt in Stewart's Cavalry. Siler of Macon County, NC, enlisted on 5/16/1861 as a Captain. On 5/16/1861 he was commissioned into Company K of the 1st North Carolina Infantry. He was discharged for promotion on 8/2/1862 when he was commissioned into Field & Staff of the 7th Battalion, North Carolina Cavalry which he commanded along with Lieutenant Colonel George N. The 7th Battalion NC Cavalry was later merged into the 65th North Carolina Regiment - 6th Cavalry. His service record lists him as: POW 10/14/1862 Boonsboro, MD / Wounded 10/14/1862 Boonsboro, MD / Confined 10/15/1862 Fort McHenry, MD (Estimated day) / Exchanged 12/10/1862 City Point, VA / Hospitalized 12/10/1862 Petersburg, VA / Paroled 12/10/1862 City Point, VA / Furloughed 12/18/1862 (place not stated) (40 days). Siler's date and method of discharge is not stated but it does appear he survived the War. 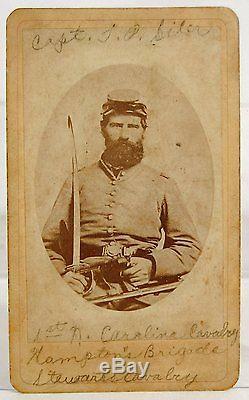 This very rare and wonderful, Double Armed Confederate Cavalry Officer CDV Photograph is in very good condition. The Albumen Photograph itself exhibits sharp focus, strong contrast and rich tonality. Both the Photograph and the card mount is have some soiling as can be seen in the scans below. This Photograph is unconditionally guaranteed to be an original, mid 19th century, albumen Image - it is not a reprint, reproduction, or modern printing but is an original Albumen CDV Photograph of the mid 19th century. An exceptionally rare and wonderful, Albumen CDV Photograph of Confederate Civil War Cavalry Captain Thaddeus P. Siler - double armed with cavalry sword and revolver and a fantastic addition to any collection!! The item "1860's CIVIL WAR CDV PHOTOGRAPH OF CONFEDERATE DOUBLE ARMED CAVALRY OFFICER" is in sale since Friday, January 15, 2016. This item is in the category "Collectibles\Militaria\Civil War (1861-65)\Original Period Items\Photographs".